Looking for a light, flavorful and healthy option to satisfy your pregnant appetite? Loaded with DHA, magnesium and fiber, this salmon dish is the perfect nutritious meal for the expectant mama. Bring 5 cups of water to a boil in a large saucepan. Place green tea, ginger and peppercorns in the pan, turn off heat and let steep for 10 minutes. In a medium saucepan, bring 6 cups of water to a boil. Add buckwheat and reduce heat to a simmer for 5 minutes or until tender. Drain and set aside. Mix basil, garlic, olive oil, lemon juice and salt in a blender or food processor until well mixed. Use a slotted spoon to remove solids from tea pan. Place salmon in tea broth and bring to a slight simmer. Cook for 8 minutes or until salmon is opaque and flaky. Adjust heat as needed. Break up salmon with a fork once cooked and toss with fennel, buckwheat and green onion in a large bowl. Divide among plates and drizzle with basil dressing. Although some fish may be off limits while you are pregnant, eating salmon is actually great way to get essential fatty acids that are vital for baby’s brain and eye development. Try this easy sticky salmon recipe paired with brown rice and veggies to create some healthy and delicious brain food for you and your baby. Place ingredients for marinade in a small saucepan and stir over low heat until sugar has dissolved. Remove from heat and pour into oven-safe dish. Allow to cool. Add cubes of salmon and turn to coat in sauce. Serve with brown rice and your favorite vegetables and enjoy! While certain types of fish are not recommended in pregnancy, having "safe" fish regularly is actually quite beneficial. Salmon, for example, is an excellent source of DHA, an Omega-3 fatty acid essential to the development of baby's brain, eyes, and heart. Sufficient intake of DHA has also shown to help labor progress smoother, increase skin integrity, and decrease the risk of tearing in childbirth. The following recipe is a high protein, nutrient-rich, quick and easy dinner recipe. 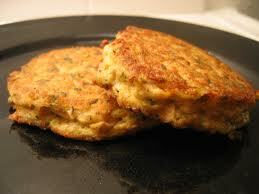 Note: You may want to make the patties ahead of time (the night before) to intensify the flavors. You can grill on BBQ or stovetop for dinner the next day.